Kirk Cousins might as well have had a cavalcade surrounding him when he arrived last spring proclaimed as the Vikings’ missing piece to reach an elusive Super Bowl. Cousins, who started consecutive games 50-65 this season, decried the notion every step of the way. Already an established quarterback with an early playoff exit, Cousins entered the 2018 season saying everybody needed to play well and he, in order to be mentioned among greats, needed to overcome whatever deficiencies weighed them down. With Cousins, the Vikings collectively failed in his first season while ranking 19th in scoring and 26th in both third downs and the red zone. Grades are based on a 1-to-5 scale, with ‘5’ marking excellence, ‘4’ for above-average, ‘3’ for average, ‘2’ for below-average and ‘1’ for failure to perform. Players that did not accrue a season (weren’t on the active roster for at least six weeks) or played in three games or fewer are not graded. Below are individual grades, based on game and practice observations, weekly film reviews and interviews with coaches, for three quarterbacks who finished the season on the Vikings’ active roster, injured reserve or practice squad. Unofficial NFL stats, such as QB pressures, missed tackles and targeted passes, are compiled by ProFootballFocus.com. Kirk Cousins (3.0) — One of six handpicked team captains. Signed a three-year, $84 million contract, the NFL’s first fully guaranteed of its magnitude, and was immediately tasked with orchestrating an evolving offense behind a patchwork offensive line. Didn’t miss a down. Played 1,051 snaps [100%]. Led the Vikings to chances at six wins in the first seven games, but fell short at Green Bay and Los Angeles due to late turnovers as well as kicking and defensive problems. Threw for career highs in completion percentage (70.1) and touchdowns (30). Played well in early road trips to Green Bay, L.A. and Philadelphia, overcoming frequent pressure with big-time throws. Backed up to his own five-yard line, Cousins had Fletcher Cox in his face when he threw a perfect 35-yard touch pass to Adam Thielen, who ran the rest of the 68-yard gain. Cousins was one of the NFL’s best deep passers despite ranking 13th in long balls thrown and 25th in how often they were attempted (10.6%). He gives the Vikings a quarterback capable of throwing a 65-yard bomb like this touchdown to Stefon Diggs. Coaches aim to improve some inconsistent mechanics, but when he’s right he can flash a strong arm with downfield precision. Only three quarterbacks, Patrick Mahomes, Ben Roethlisberger and Russell Wilson, had more deep touchdown passes than Cousins’ 13. But Cousins’ play under pressure, a reason why the Vikings sat at 5-3-1 entering the Week 10 bye, fell off upon returning from the bye to play in Chicago. He was the NFL’s third-rated passer under pressure (91.5 rating) in Weeks 1-9. His rating under pressured dropped to 22nd (69.5) in Weeks 11-17, when the Vikings had four games against three top scoring defenses in Chicago, New England and Seattle and Mike Zimmer fired coordinator John DeFilippo. Shortening the play calls was one change under Kevin Stefanski, which is not a small adjustment considering their spotty hurry-up offense. Slow starts also anchored the offense after the bye. Five of the last seven games began with a three-and-out series. Turnovers were Cousins’ undoing. Only two quarterbacks in Josh Rosen (19 turnovers) and Ben Roethlisberger (18) had more turnovers than Cousins’ 17. He lost a career-high and NFL-leading seven fumbles, including two to start the Week 3 loss to Buffalo. Some interceptions were a product of miscommunication, like Stefon Diggs’ stopped route against New Orleans and Kyle Rudolph watching the ball sail overhead in Chicago. Some were simply boneheaded plays, like Eddie Jackson’s pick six in Chicago when Diggs was open in the flat but Cousins threw to a covered Laquon Treadwell. The timing compounded the turnovers. 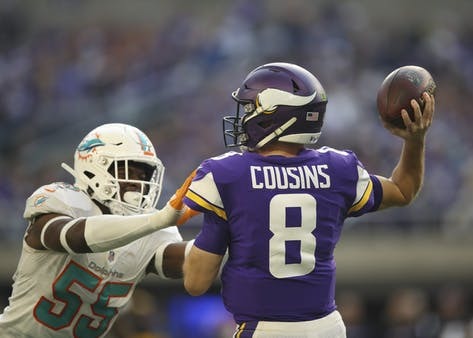 Cousins led the NFL with eight turnovers in the fourth quarter and overtime, tied with Denver’s Case Keenum and Detroit’s Matthew Stafford, according to Pro Football Reference. Three of five defensive touchdowns attributed to Cousins came in the second half of key losses against the Saints, Bears and Seahawks. Cousins was candid about his need to better improvise when plays break down, which they too often did in 2018. Any extra emphasis didn’t produce much in results as Cousins scrambled for few first downs this season. Held to a career-low 132 passing yards in the season finale loss against the Bears, which began with four consecutive three-and-outs. An inability to overcome deficits (0-7-1 when tied or trailing at halftime) was a critical problem. Cousins was the NFL’s only quarterback to start every game this season and not have at least one game-winning drive. His closest attempt, in Green Bay, was emblematic of the season as one cylinder fired properly in Cousins, but another, rookie kicker Daniel Carlson, did not. Trevor Siemian (N/A) — Acquired from Denver last spring for a fifth-round pick. Held onto the backup job throughout an uneven summer and was active for all 16 games. Led scoring drives on five of 20 possessions in the preseason, playing poorly enough in the third-game dress rehearsal he started the exhibition finale. Did not play after 24 starts the previous two seasons. Earned $1.9 million on the final year of his rookie contract. Pending free agent. Turned 27 years old last month. Kyle Sloter (N/A) — In his second NFL preseason, Sloter led two final-minute thrillers ending in a game-losing fumble against the Jaguars and a game-winning touchdown over the Seahawks. It was emblematic of an up-and-down training camp that kept him in the No. 3 spot this season. Inactive all 16 games. Completed 41-of-56 passes [73.2%] for 366 yards and four touchdowns in the preseason. Added six carries for 33 yards and a rushing touchdown. Turns 25 next month. May compete for the backup job next summer depending on the offseason move.